While our discussion of Good Soundproofing pointed out that much better than minimum walls are available with simple improvements to standard construction, you might think that "better" soundproofing required a much more complicated process; that is not the case at all! Again we are able to provide better results than staggered stud, and sometimes better than double wall construction, at a lower cost, and save usable space. Our "better" soundproofing will provide Luxury Sound Ratings between living spaces, and the required sound blocking for your Home Theater Walls, Home Studio Walls, or Band Rehearsal Walls. 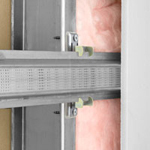 Better Soundproofing is available with one very important principle added to your wall construction; the elimination of mechanical connection between one side and the other. We call this process decoupling, and you can achieve this with less than $1.00 per square foot (bottom of page) added to your construction cost. All noise is actually vibration energy, this excites the particles in air and you "hear" the sounds with your eardrum. Sound Transmission, Footstep Noise, Traffic Noise or Neighbor Noise is all basically vibration energy. The lower the frequency, think bass drum, the more actual energy is present. Lower frequency noise is the hardest to block or absorb. In residential, commercial and mixed-use construction we simply cannot build a heavy enough wall to block the lowest frequencies. Additionally, low frequency noise is more likely to travel through the structure than high frequency noise, further complicating the process. To effectively defeat low frequency noise, and the transmission of noise through the structure, we need to decouple one side of the wall, and by using QuietClips, we can do just that. Decoupling requires that we eliminate the 100's of connection points created by screws, nails, brackets, plates etc. We use clips and furring channel to float walls, the sheetrock is screwed to the channel, the channel is supported by the clip, and no screws pass through the channel- mechanical isolation for one side of the wall! 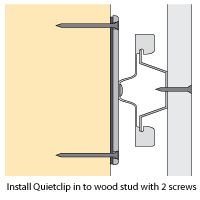 Adding ISOMAX Clips to a basic single stud, insulated wall with STC 37-40 will raise the sound rating to a remarkable STC 57. Compare the added cost of soundproofing products in the shown assemblies above, and you will be able to make an educated decision when choosing your solution; you don't always get what you paid for! 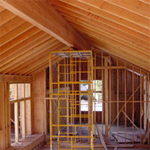 There is even more performance available, see Best Soundproofing.